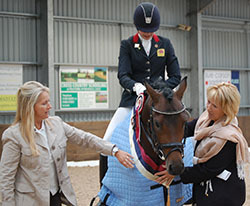 The Overall Champion was the top 4 year old pony, the German-bred stallion Der Kleine Lord (pictured on left wearing his SPSS Thermatex Rug prize), ridden by Erin Williams and owned by her mother, Clare. Reserve Champion was the second placed 4 year old, the British bred gelding Johnny Cash, ridden by Phoebe Peters, owned by Noah Springall and bred by Mrs C Springall. The SPSS is very grateful for the support of both British Dressage, who kindly donated vouchers to the highest scoring pony in each age group, and Vale View who hosted the event. We were delighted to again have as judges, Jenny Ward and Sarah Pidgley, who as well as being British Dressage List One Judges, are also the British Dressage Pony Team Selectors. Jenny commented afterwards that they had enjoyed judging the ponies but did wish there had been more of them entered! Jenny also said that both the Champion and Reserve showed the correct way of training and were loose and submissive. Overall, Jenny and Sarah thought that the 4 year olds were the better presented and ridden although the exceptionally windy day and rattling arena doors did affect some of them. Looking across the entrants, they also felt that some of the riders were too big for the young ponies and that this affected the ponies' movement. Sarah kindly presented the rosettes to the overall top 3 ponies while Jenny announced the results (and so escaped most of the photographs!). Both judges are however pictured on the right, adjusting Der Kleine Lord's sash before his lap of honour. Overall Champion, Der Kleine Lord is pictured on the left. Unless otherwise credited, all photographs are by kind permission of Hannah Owen. No pictures may be copied without the permission of the photographer. Overall Champion and Winner of the 4 Year old Class, Der Kleine Lord, ridden by Erin Williams and owned by her mother, Clare, won £75, a SPSS Thermatex rug, and a voucher for Free British Dressage Horse Registration (kindly donated by British Dressage). The judges felt that Der Kleine Lord showed the correct way of training and was loose and submissive with an exceptional off the floor canter and a good trot but that he needed more freedom in the walk. Der Kleine Lord (known as "Lordy") is a German Riding Pony (DRP) registered with the Westfalian studbook. He is by Der Feine Lord AT (DRP) out of Chantre's Lady (DRP) (by Chantre B (DRP)) and was bred by Reiner Bockholt. This was Lordy's first competition although 13 year old Erin had taken him to the Sheepgate Under 25s Championships along with her FEI ponies and so he had experienced the show atmosphere before which proved to be useful with the high winds causing the area to rattle and upset other ponies. Lordy's sire, Der Feine Lord AT was on the German gold medal winning European team in 2009, finishing 3rd in the Team Test. Reserve Champion and second placed in the 4 year old section, the British bred gelding Johnny Cash, ridden by Phoebe Peters and owned by Noah Springall won £50. The judges felt that Johnny Cash also showed the correct way of training and was loose and swinging through his back with his canter and walk showing lots of promise. As yet in the trot, they felt that he needs to be stronger for better stepping under from behind. Johnny is a SHB(GB) registered TBxNF pony by The Bay Briar (TB) out of Macy Gray (New Forest) and was bred by Mrs C Springall. Johnny should have been ridden by 14 year old Fern Roach, who has been producing Johnny as an event pony since March this year, but Fern unfortunately broke her collar bone 2 weeks before the show and Phoebe Peters kindly stepped in as substitute. Together, Johnny and Fern have qualified for 4year old Lycetts Championships at end of September, HOYS Working Hunter Pony, Trailblazers National Championships (finishing 7th overall), British Riding Club BE80 championships and the Burghley Event Pony Championship (at which her sister had to step in and ride for her). 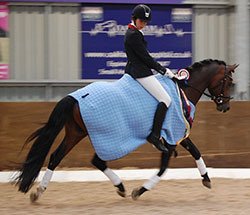 The £25 for 3rd place overall went to the Top 6 Year Old pony, Rufus, ridden by Lauren Harper. As highest scoring 6 year old pony, Rufus also won a voucher for 50% off British Dressage Horse Registration (kindly supplied by British Dressage). The judges thought that Rufus was well presented and well trained which gained marks but could still work through more and open his frame. 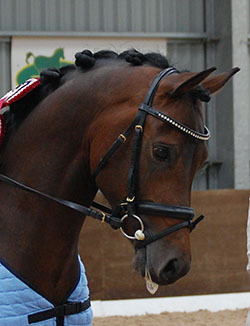 Rufus is a German Riding Pony registered in the Weser Ems studbook and was bred in Germany by Arno Panten. Rufus is by the German Riding Pony Renoir out of a mare by Nerz. 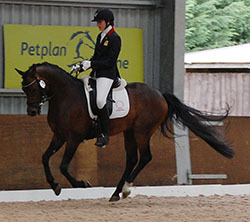 Renoir is also the sire of 2009 Team Silver and 2010 Team Gold medal winning stallion, Rembrandt DDH (who will be doing a display at the 2011 SPSS Gradings on 1st October at Bury Farm EC, near Luton. 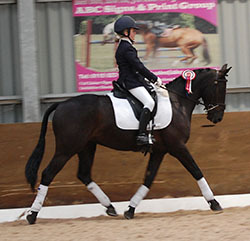 Previous owner, Francesca Walker, of Blackington Stud, brought Rufus on from a recently backed 3 year old to being Overall Champion Young Dressage Pony in 2010. 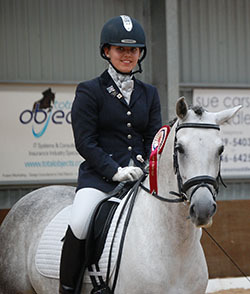 Rufus was then sold to current owner Eva Pascoe-Rowe and is now ridden by 15 year old Lauren. Top 5 Year Old Pony and winner of a voucher for 50% off British Dressage Horse Registration (kindly supplied by British Dressage) was DeLaRoche Birthday Girl ridden by Alice Perry. DeLaRoche Birthday Girl is known as "Dela" and she was bred by Lucy Sheldrake of DeLaRoche Stud. 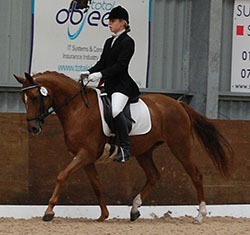 Dela is now owned by Elaine Coleridge Smith of Windmill Farm Dressage and Lindsay Coleridge Smith has been training Dela and her rider over the last two years. At last year's event, Alice and Dela were Reserve Champions and the judges commented that Dela impressed them again this year. Dela is by the SPSS graded stallion Bernwode Brokat, who was awarded a BEF Futurity Certificate of Merit for Sports Pony Leading Sire in 2010 and in 2011. Dela's dam, It's Herself, is a 15hh TB by Itsu who prior to going to stud was a successful show hunter pony and graded into the WBS Head Studbook. The SPSS Teddy for the youngest rider went to 12 year old Mia Mordecai-Smith who was third in the 4 Year Old section riding her father, Graham Smith's Springfieldpark Mr Yahoo. Known as "Teddy", Springfieldpark Mr Yahoo is a British-bred WPCS Sec C Palomino Gelding by Springfieldpark Dot Com (WPCS Sec C) out of Maesllwch Lilibet (WPCS Sec C) (by Tinvaal Gaucho (WPCS Sec C)) bred by Mrs D E Hand. 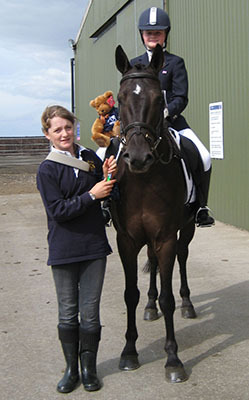 As almost the youngest rider (just a month older than Mia), Phoebe Peters was also presented with a SPSS Teddy. Phoebe is pictured below on the right with pony, Johnny Cash and his regular rider, Fern Roach, who sadly broke her collar bone 2 weeks before the competition so Phoebe kindly stepped in and they were 2nd in the 4 year old class then Reserve Champions overall. Credit to both Phoebe for a fantastic result when she'd only ridden the pony twice before but also to Fern for bringing him on to this level. 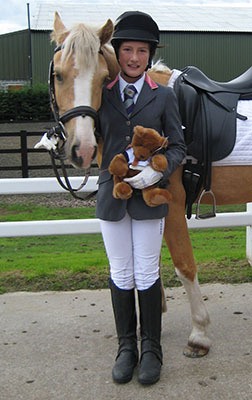 Youngest Rider, 12 year old Mia Mordecai-Smith with "Teddy" (aka Springfieldpark Mr Yahoo) and her SPSS Teddy prize. Fern Roach (standing) and Phoebe Peters (riding) with Reserve Champion, Johnny Cash and Phoebe's prize Teddy.